Hellmann's Light ½ the Fat Mayonnaise Type Dressing has 50% less fat and 50% fewer calories of Hellmann’s Real Mayonnaise, and starts with Canadian-sourced ingredients including free-run eggs from Canadian farmers. Guests want healthier options that taste great. 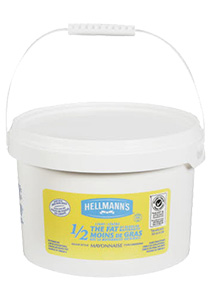 Hellmann’s® ½ the Fat Mayonnaise has half the fat, with all the flavour. Great taste, half the fat. Ideal for sandwiches, sandwich and wrap filling, Caesar and Coleslaw dressings.